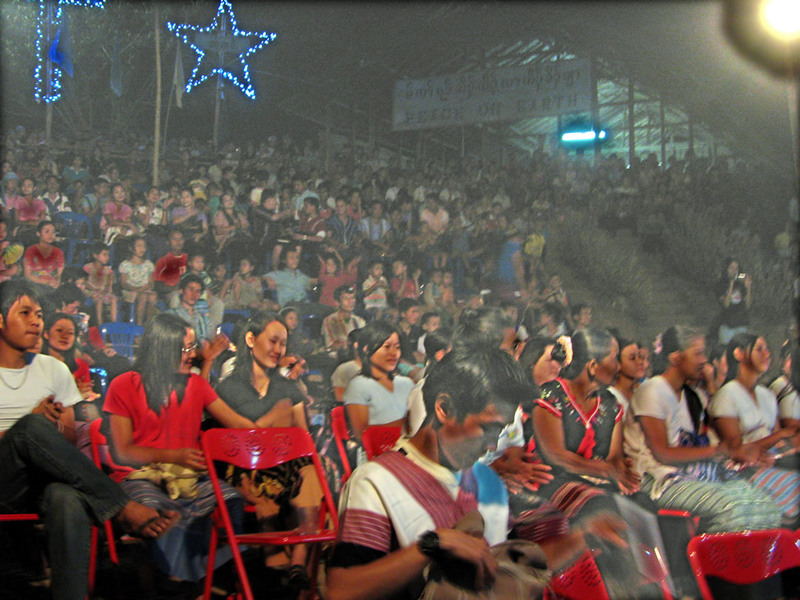 Life in Mae Sot (the local town, which Lonely Planet describes as something of a cross between Hicksville and the Wild West) is quite a change from Mae La. For a start there is the famous Canadian guy’s café (see any guide book for directions), with bacon burgers and French fries with blue cheese dip, as well as coffee for purists. The Bai Fern guesthouse does a similar range of foreign food, but better fries, if you stay there it has WiFi. However, all these places still have the feel of being in Thailand, just not in the camp. By contrast the café we discovered in Mae Sot Mall is pure International. We were in the “Mall” (a small new shopping arcade) because the women have decided that Thai massage is a good way to relax – my shave and haircut took a quarter the time, and with a hot shower (at the guest house) made me feel fresh and clean! The Coffee and Cake joint has free WiFi or a desktop clients can use for free, the coffee including Barbara’s Soy Cappuccino and Sarah’s Moccaccino was good and about NZ$1 each, the chocolate cake was superb. We did not dare try the chocolates, as we had pigged out on fries for lunch already.The mall is on the same street as the police station, near the 7-eleven and the post office, the café is called Hazel. The border between Thailand and Burma is surprisingly porous. We began to be aware of this when we crossed “the bridge” to renew our visas. Our trip to the local church celebration last Sunday underlined just how permeable a frontier drawn on a map can be. 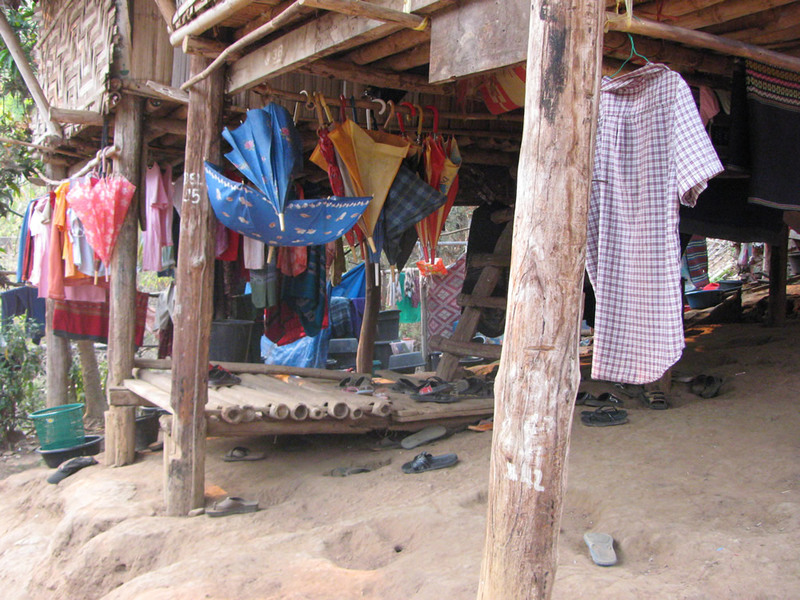 It is also home to a school, which teaches not only village children, but also children whose parents live inside Burma (they live in dormitories) and some from refugee camps too. One teacher we talked to a lot gave us a good impression of a school with very few resources indeed, except the people. 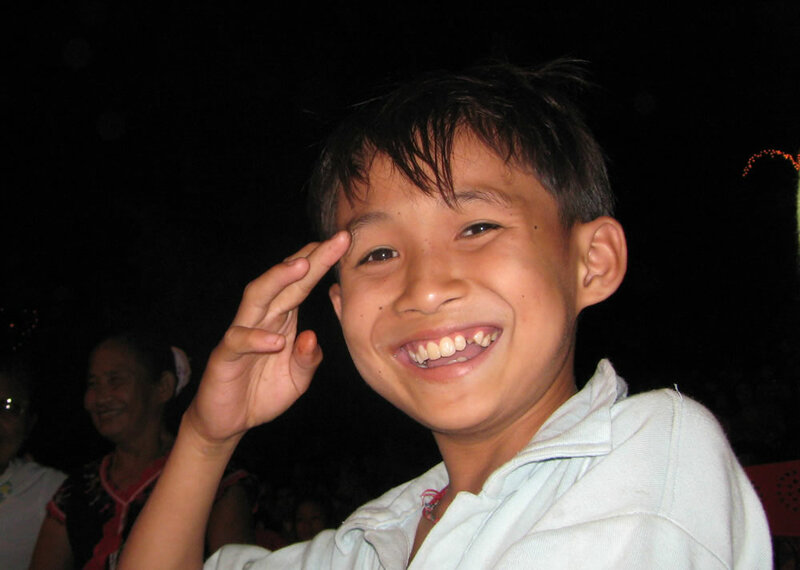 The children get meals (thanks to Children on the Edge – the Body Shop Foundation): rice everyday, meat at least once a month, and vegetables, yellow beans or fish paste each twice a week. However, there are few or no textbooks, even for the teachers to use. The guy we talked with has studied engineering in Burma (at Mandalay University) before fleeing to China and getting a degree in Computers, Maths and English. I wonder how many NZ schools on making a change to the curriculum get rid of the old textbooks. If you know of one do let us know, maybe we can arrange to get them to people who will really use the “old” books. In some subjects real numbers would be great, in others enough for the teachers to use or to make a small library for the students would help. 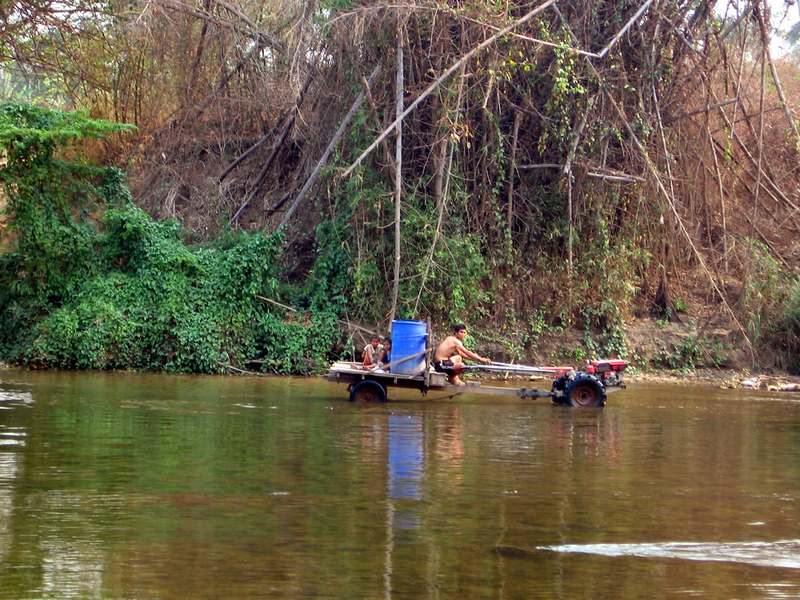 As a final illustration of the porous border we went for a bath at the river, and watched motorized bullock carts (powered by rotovator engines) go back and forward across the frontier, or sometimes merely down the border to re-enter Burma a hundred or two meters downstream. The celebrations bagan with a wedding – not part of the jubilee or the assembly/convention of the KKBC (Kawthoolei Karen Baptist Churches) but an appreciated addition (with maybe some photos or video when I get time to sort and edit them). We start at 6am with a service, though the noise starts earlie – not least testing the temperamental sound system. Then breakfast – the full Karen deal with rice, meat, chicken and veges. There are meetings through the day, though we are not really involved, since they are all in Karen (I wish I could follow enough Karen to attend the KKBBSC meeting, I’d love to be involved in the discussions about a programme to follow the BTS). However, we are next to the computer and communications centre (the room that the teacher who is responsible for IT occupies, with his mobile phone) which is often a busy place at night… So the afternoon is for sleep (if possible). The morning is for preparation – I give the “charge to the graduates” on Saturday morning – and marking both Barbara and I have assignments to mark. Here are two photos we took on a walk around this section of the camp. How is my teaching changed by being here? The first change is unsurprising, I need to use less complex English. The students are Karen speakers, most of them know either Thai or Burmese or both, and they use English almost only for their studies – remember that they watch no television or films, they read no magazines, most of the usual ways in which people around the world practice and improve their English are not available to students here. So, I need to choose simpler ways of saying things. Actually, like most teachers, I have loved reading since childhood, enjoy words and wordplay, and so even when I am teaching a University class of native-born English speakers I need to simplify the language I use. All classes need technical terms explained – that’s part of what teaching is about, not a new skill. The paragraph above already introduced one of the changes that we had not really expected – at least not at the level deeper than “thoughts”. These students have far less experience of world than most. Quite a few of the class were born in the camps, even more first entered a camp while they were of primary school age. Few radios, almost no TVs, and very few print publications enter the camp. 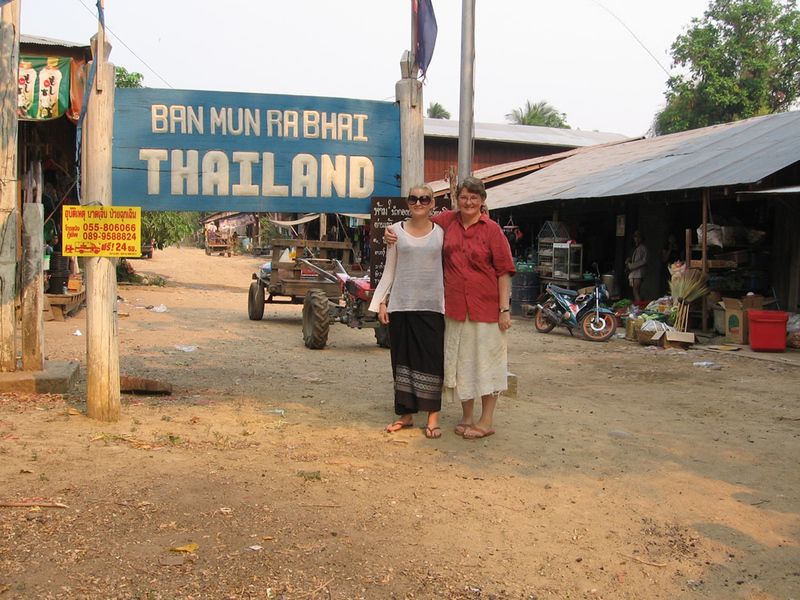 Most people here do not get holidays, but may unofficially visit a Thai-Karen village (along the border strip, but inhabited by Karen who have Thai nationality and so are free to move). There are two PCs which share the Internet connection that I am using, but few students get time enough to use these for long enough to really learn how to discover the world electronically. 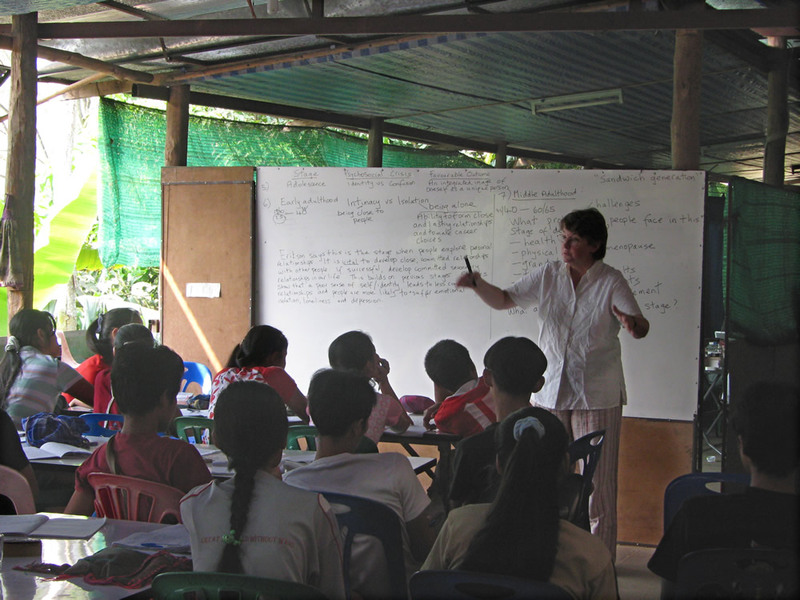 Those who can, print out pages with news from the Free Burma Rangers, and other Karen/Burma related news items, and post them up on the school notice board. Shopping means either a visit to one of the little “shops” that several of the neighbouring families run – tea, coffee, washing powder, water in bottles, even luxuries like banana chips, or Fanta. For larger or more complex shopping – like when we needed pens to write on the whiteboards – there is the small unofficial market nearer the middle of the camp. Their experience is limited to the few thousand people in this part of the camp, with occasional glimpses of the wider world beyond the wire. A third change is again no surprise, though it might have the biggest impact on teaching. Students here have a greater and deeper spirituality than “Western” students. The Bible lives for them, and it governs their lives to an extent that few Western Fundamentalists can really imagine, yet they are not Fundamentalists. They are quite ready to read the Bible flexibly, and are open to notions that the people whose lives are recorded in the Bible grew and developed in their understanding of God. They are even open to the idea that different parts of the Bible can express God, and God’s purposes for humanity, more or less well, fully and clearly… nevertheless (or precisely because of this?) they read, pray and meditate on the Bible from morning to night, to an extent that even my uncle (a longstanding Brethren Elder, who tried to be as “biblical” as he could in every aspect of his life) could not manage in a “normal” Western context. How this difference can/should modify my teaching I am very unsure at present, to some extent it was similar in Africa, but it was also very different. Congo celebrated the centenary of the first Protestant missionaries just before our arrival there, and the Old Testament was only translated into even the main trade languages as recently as the 1970s. Christian faith and the Bible both had shallow roots in Congo. Karen contact with the gospel and the Bible goes back to William Carey, and then the American Baptist missionaries Adoniram and Ann Judson in 1812. There has been a Sgaw Karen translation of the Bible available since 1853. This means that Christian spirituality and the Bible are far more deeply integrated into Karen life and people, so a simplistic approach that merely teaches about the contents of the Bible is less appropriate. Then there is the specialist knowledge that teachers always hope students will bring to the class, and which we assume has grown from year to year as a student progresses. With this class, while knowledge of the contents of the Bible and of basic theology are really good, their understanding of scholarship is low or even non-existent. Basic skills like analysing – breaking a problem down into simpler parts, imaginative reconstruction of the way things “must have been”, looking things up in a reference works (except the universal Karen-English dictionaries for unknown English words), organising thought to lead towards a conclusion… such skills that in a Western context we assume were learned (or at least first begun) in school, here seem strange. A basic study-skills course, and an improved library with a small stock of good Bible dictionaries, concordance, commentaries etc. could make real changes. But that is to look at things from a Western Academic perspective, the sort of things that spring to mind as necessary changes are conditioned by my usual setting. One of my frustrations is that a combination of Karen introversion (and this must rate as a highly introverted culture by any standards! ); cultural respect for teachers, foreigners and elders and the busyness of the coming jubilee – which is literally the biggest event in decades, all make it difficult to meet, talk with and learn from the Karen teachers who are probably the people with the best chance of telling me how my teaching should change to be appropriate here. Maybe next time?